The advertising campaign in New York telling men to stop "manspreading" has cost the city’s taxpayers more than $76,000. "Dude…Stop the Spread, Please" was the biggest takeaway from the Metropolitan Transportation Authority’s (MTA) new campaign announced last month, instructing riders on proper subway etiquette. "Manspreading" is when a man keeps his legs apart while sitting. Invoices obtained by the Washington Free Beacon from the MTA through a Freedom of Information Law request reveal that the campaign has cost $76,707.70. The MTA hired Edison Lithograph and Printing Corp. to print thousands of posters and placards, which will appear in 2,600 subway cars. The company produces all of MTA’s advertising and brochures. The MTA is $34.4 billion in debt. 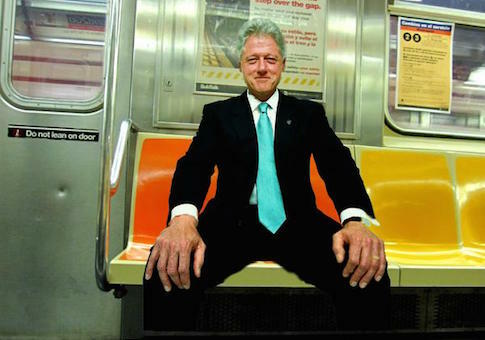 While online commenters complain that manspreading is "ridiculous male privilege," defenders of the practice argue, "I need to sit that way because of my balls." Others decry that "women put their handbags on seats all the time." The Canadian Association for Equality, which is fighting a potential ban of manspreading in Toronto, agreed. "This sets a very bad precedent as men opening their legs is something we have to do due to our biology," the group wrote in a petition to the Toronto Transit Commission. "It sometimes can be physically painful for [us] to close our legs and we can't be expected to do so." They added that manspreading is a "sexist term, and is the simple act of opening your legs." The MTA said promoting good etiquette makes the subway more enjoyable for everyone. "The new program, developed by MTA Corporate Communications, highlights behaviors that are both encouraged and discouraged for the benefit of everyone," a press release announcing the campaign said. "The messaging largely reflects complaints and suggestions from riders." "The colorfully-designed placards employ simple graphics to illustrate behavioral ‘do’ and ‘don’t’ scenarios," the MTA added. "The illustrations are reinforced with pithy statements." Besides manspreading, the list of "no no’s" include "clipping" your hair, "primping," and "blocking doors." "Poles are for your safety, not your latest routine," will also appear on an ad.